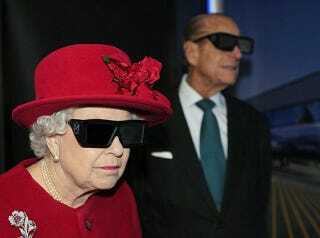 Britain's Very Royal Wedding to be Filmed in 3D? Apparently Prince William and Kate Middleton's wedding—aka, THE (British) event of the decade—will be broadcast in 3D in the UK. Because what Brits really want to see is Prince Charles leering out of their non-existant 3DTVs? Admirably, the television networks are trying to scratch together a deal so the much-larger 3D cameras won't impose on the "intimacy" of the royal wedding, which is to be held at Westminster Abbey on the 29th of April. A royal aide told The Telegraph that they "are very open-minded about the idea of 3D coverage, provided that the broadcast does not intrude on the ceremony in the Abbey. We want to avoid a situation where cameras are in guests' faces and ensure that the couple don't feel like they are in a television studio."